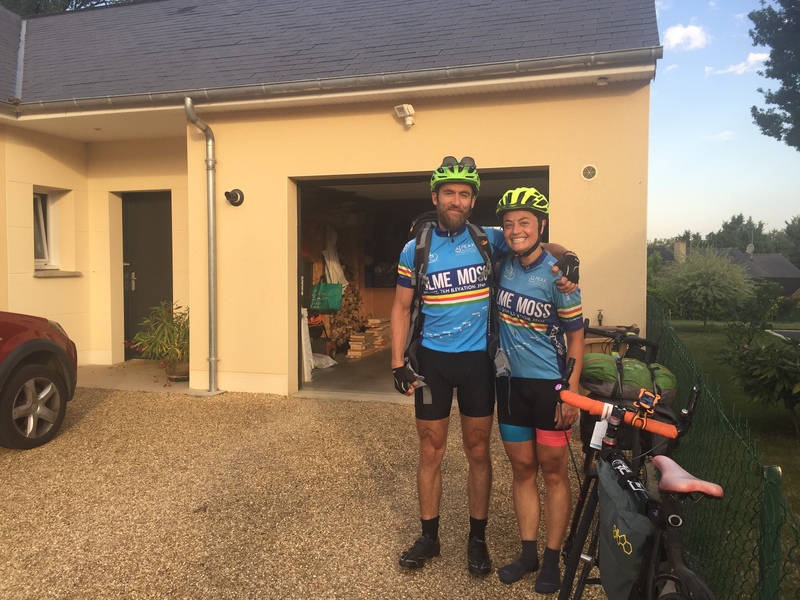 On 6 July, Kieron and I set off from Argentre to Bressuire to continue our ride south to Annepont. We had another monster day ahead of us at around 190km’s of riding and it was set to be another scorching hot day. We had our matching Holme Moss cycling tops on (thanks to Kieron) and were set for the day in true team spirit style. For the first 50km, we followed the cycle path which ran alongside an old railway line. It was peaceful and car free but a bit tedious at times and every so often got the better of me. All we’d had was coffee for breakfast, so as soon as we passed through a town, we stopped to find a patisserie. We stopped in Craon for pastries and Orangina, good timing, as by this time the heat was rising. Who ate all the pastries…?! Whilst eating our pastries a car reversed into my bike. At first, I didn’t think anything of it as it was a very small knock, but after careful inspection, it had jilted my gears a little. The driver was extremely apologetic which made me feel better and after all, I had to just ride and get on with it! It was working OK and could have been worse. The next part of the ride was made up of lots of straight undulating roads that just seemed to go on for ever. It was mind over matter. The heat didn’t help as there simply wasn’t much shade around, so we saw a fountain and immediately stopped to have a dip and try and cool down. Loch Ness Monster type roads that mess with your mind! It wasn’t long before we passed a small town where outside a church there were mannequins dressed up in different clothes and scenarios from around the world. It was so weird we just had to stop and have a gander. We proceeded to piss ourselves laughing by inspecting the weird models and having our photos taken in each country; Mexico, Peru, Alaska, America, Brazil and Canada. Needless to say, it was a welcome break from being in the saddle for hours. At every opportunity, we tried to cool down as we carried on our ride to Bressuire. We stopped at a farm to fill up our water bottles and a crazy farm lady welcomed us into her home with open arms and poured us ice cold juice and gave us cold wet flannels whilst she filled up our water – bliss! We found an outdoor tap in a small town and hung out near it for a while getting some strange looks (when you’re that hot you just don’t care) and best of all, waited for several rotations of a farmer’s sprinkler watering their field. After we left Kieron said, ‘I think they put pesticides in that,’ oh well, it had been done now and perhaps it made us stronger! We had finally arrived in Bressuire, a large built up town with a friendly face, Michele our host for the night. Once we dropped our bikes off in her garden, she immediately brought us out water melon and beers, amazing. The only problem is, I couldn’t sit down. Literally. Kieron and Michele laughed at my attempts for several minutes until I found a softer chair to sit on. Now I could relax! Sums up well the extent of our efforts this day! Our total distance was 188km, just under 10 hours riding time and 1,500m elevation climbed. What a whopper of a day and two big rides in a row. Watch the short film below to see the entire journey. Click here to read Kieron Ramsay’s blog write up on day 4 – More Fun Than Pain. Next Bressuire to Annepont, France + wedding day!